A hypothetical design sequence was prepared to show how significant the lock choice and lock system layout are to attaining a canal’s maximum potential. The sequence that follows describes how lock system options are developed as canal requirements are defined. It serves to demonstrate the value that a proper lock assessment process adds to the development of a canal. This hypothetical case study contemplates the building of a waterway to connect two oceans across a stretch of land that separates them – a situation similar to that of the Panama Canal. · Gravity-operated locks are to be used, such being considered the practical ship-lifting solution. · The height that ships in transit are to be lifted can be handled with a one-step lock system. · Maximum transits of the typically expected ships would be 20 a day per lane through a traditionally operated lock. As the needs this hypothetical canal will service are defined, it is recognized that it should transit more than 20 ships a day. Thus, a study to find other operating approaches that would allow more transits is commissioned. Engineers initially identify three options that nearly double capacity, all of which require adding a second lane. 1. Two lock chambers could be built side-by-side at each end of the canal, and the direction of transits of these changed with every ship to cut water-use in half. · Each lane would transit 17 instead of 20 ships a day, totaling 34, as transits are slower in that water-saving mode. · Those 34 daily transits would use 85% of the available water, with water left over due to the operating day ending. 2. Two lock chambers could be built side-by-side at each end of the canal, with two water-recycling tanks added alongside each chamber to cut water-use in half. · Each lane would be dedicated to transits in one direction. Water would be moved in three stages during the operation of these locks. These water-transfers would not add as much time to transits as reversing the lane. · Each lane would transits 18 instead of 20 ships a day for a total of 36. · Those 36 daily transits would use 90% of the available water, likewise with water left over due to the day ending. 3. Two lock chambers could be built side-by-side at each end of the canal, with the drains of adjacent chambers connected to each other by pipes with valves so that they can share water and cut water-use in half. · Each lane would transit 19 ships a day for a total of 38. · Those 38 daily transits would use 95% of the available water for the same reason noted previously. Realizing that the extra capacity added by the above lock options would leave no room for future growth, system options allowing even more transits are sought. 4. Three lock chambers could be built side-to-side at each end of the canal of which two chambers would be piped together to share water and the third chamber would work alone. · Transits through all would be reversed with every ship. · Each paired lane would transit 16 ships a day; the lone lane would transit 17. · Those 49 in total daily transits would use 82.5% of the available water. 5. Three lock chambers could be built side-to-side at each end of the canal of which two chambers would be paired to share water, with this water-sharing operations including two recycling tanks. The third chamber would have three recycling tanks. · Each of the paired chambers could either, always transit in opposite directions or, they could both transit half the day in one direction and half the day in the other. The third lane would transit its ships half the day in one direction and the other half in the other direction. · Each lane would transit 18 ships a day for a total of 54. · Transiting 54 ships would use 96% of the available water. 6. Four lock chambers could be built side-to-side at each end of the canal, chamber pairs working together sharing water. · Transits of each chamber would be reversed with every ship. · 16 ships would transit each lane per day for a total of 64. · Those 64 ships would use 80% of the available water. · Enough water is left to add a 15-ship-a-day fifth lane with 3 tanks per chamber that reverses after each ship. 7. Four lock chambers could be built side-to-side at each end of the canal, chamber pairs working together sharing water in coordination with two recycling tanks placed between them. · Transits through each chamber would be reversed with every ship. · 15 ships would transit each lane each day for a total of 60. · Enough water is left for 4 more equal lanes (i.e. 6 times the transits of a traditional set of locks could be attained with what the watershed supplies). For ease of comparison, the above cases are summarized in the table that follows. This case study shows that, while all of the solutions work, the canal’s potential is hugely affected by what is built. If future growth is at all important, it is vital to estimate future canal needs and initially build the lock solution that best provides for the near term while keeping the canal’s maximum potential attainable. A list of options – such as that summarized above – must be created from which to select the optimal solution. Creating a list of options and assessing those is not a hard and long task. It can be done in days. The types of system operating information needed are all known from past experiences and studies. With respect to the above case study, Case 3 offers the most transits for the pairs of chambers built. However, building Case 3 without considering the canal’s future needs and without a way to later access the canal’s transit potential – thereby losing that potential – would be irresponsible when ways to preserve it exist. For example, the Case 7 transit capacity – which is the greatest of the cases listed in the Table – can be preserved if Case 3 is converted into a Phase 1 of Case 7. The modifications needed to do that, in this case, would be to leave sufficient space between chamber pairs for inserting recycling tanks later and to leave points on the pipes between chambers for tying in those tanks. The later phases would be repetitions of Phase 1. Building the “cheap” solution, while ignoring future needs and the options for meeting those needs, would be a big mistake. An independent assessment of the Panama Canal Expansion Project indicates just that mistake has been made. · cuts short the attainable potential of the canal’s resources. The chosen single-lane system uses three lock steps at each end of the canal, each lock step having a chamber and three tanks. With only two such steps in an alternative single-lane system layout, the same number of ships could be transited as with the chosen three-step system, but using only about three-quarters of the water. However, it’s not advisable to use either of those alternatives as both carry an unacceptable level of risk, and constitute a dead end. Either system puts the canal’s peak potential permanently out of reach because neither system includes a higher mode of saving to switch to in the future when subsequent expansions are desired. Furthermore, with only one lane, any problem that closes any chamber shuts down either system and negatively impacts service reliability. In contrast, the Panama Canal's original two-lane locks include provisions that permit the canal's peak transit potential to be attained in subsequent expansions. In addition to being a lower risk design, the operating mode for those locks can be changed to reduce water-use to half of what is normally used. The hardware it has functions optimally in both operating modes. This fact should be emulated for the present expansion yet appears to have been overlooked. 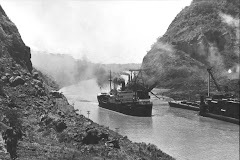 Already known when the Panama Canal was first built was that the yield obtained from a given set of gravity-operated locks could be increased if these were operated using more water (i.e. in a lesser water-saving mode). Also known was that more locks would be needed to increase a canal's capacity, and that each set of locks would need to use less water in order meet the increased transit needs within the limits of the available resources. Thus, the existing locks have the option to be operated more slowly using far less water per transit, thereby allowing the service ultimately extracted from the resource consumed to be maximized. Because saving water slows lock operations, the original Canal’s transits would have to be reduced to about 80% of “normal” to cut water-use in half. Transiting 80% of the usual traffic while consuming half the water normally consumed per transit results in only 40% the water normally used being consumed in total. That leaves about 60% of today’s water available for new lock use. With the most efficient locks available – built of conventional components and operated following conventional procedures – it is feasible to parlay that 60% of available water into operating four new lanes with chambers of equal or even larger size than those presently planned. Those four lanes could transit about 40 big ships a day in total. To benefit from these options, two lanes of the better and more flexible locks should be added to the Panama Canal instead of the planned single-lane locks. The cost and the effort involved would be about the same as that for building the planned single-lane system. Yet, two such new lanes could transit up to 24 ships a day while being operated in a less efficient mode, which is somewhat like the operating options available in today’s locks. The planned single lane locks, in contrast, are to transit 12. The only requirements for a subsequent expansion of the Panama Canal to achieve the noted 40 transits a day, would be to build two more lanes using the same lock design and to operate all four of those newer locks in their most efficient mode. More effectively arranged, higher-efficiency lanes with better performance characteristics would offer more operating options, like the possibility of considering bigger lanes and allowing faster emergency transits. An alternative system using these better locks also has the means by which to significantly reduce lake-damaging salt intrusion, if properly configured and operated. The planned system does not offer such a means. Furthermore, the official plan to confiscate neighboring water resources for a subsequent expansion is risky and unreliable. Rainfall on the Canal’s watershed is already declining due to deforestation and climate change. Those resources may have to be seized sooner to operate the present expansion. There may not be any water left for a future expansion. Plus, it shouldn’t be forgotten that seizing property and water-resources could lead to armed conflict. It is a fact that there are lock systems available that would increase canal yield far more – and far more effectively – than the planned system; while protecting watersheds and ecosystems surrounding the canal. · assuming the single-lane risk issue can be solved in a subsequent expansion. To depend on luck for all of the above expectations to be fulfilled adds unacceptable risk, particularly if all of those dependencies could be eliminated for the same cost and effort. A proper assessment of the Panama Canal system's maximum potential is crucial. The present and subsequent development efforts need then stay on a path that ultimately uses the canal's water resources as effectively as possible. There is no evidence that this type of assessment was made before locks were chosen for the present Canal expansion. It is profoundly disturbing to engineers who value the ideals of their profession that this key assessment was not done for a project with future repercussions of the magnitude of this one. Without question, the presently planned lock system is of exceptionally poor quality and must not be added to the Panama Canal. It is evident from the lack of engineering studies along the lines of the case study presented above, that the Panama Canal's long-term future, its effectiveness, and the preservation of its watershed and surrounding ecology have been ignored. From the outset, and as the project has progressed, reaching the construction stage as quickly as possible appears to be the main objective. Product quality appears to be irrelevant to the making of immediate profits. Environmental damage and how effectively resources are used seems to be equally irrelevant. Yet, should Gatún Lake’s salinity levels rise unchecked and reach critical levels, for example, there is a high probability that sea-life of both oceans will suffer irreversible damage, spilling negative effects of the project into other areas, such as the fishing industry. Conversely, with a well-integrated plan, that resource – today providing for more than just the transit of ships – could yield much more with far less damage. In particular, the growing population near the Canal would be better served by not damaging it. Improvements to the canal expansion plan benefiting Panama and the world can only be forced through outside pressure. The US built the Panama Canal for the benefit of the world and ratified a Treaty with Panama that outlined requirements intended to insure that the canal would continue benefiting the world and not just special interests. 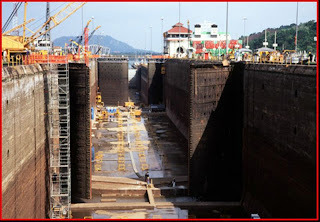 Unfortunately, the spirit of the Treaty between the United States and the Republic of Panama has seemingly been set aside, with the exception of the planned locks appearing to be just big enough to fit the size of ship desired by the US Navy. The impression is that the Government of the United States has failed to exercise the various prerogatives set forth in the Treaty. The unquestionably lopsided and undemocratic referendum held in Panama to obtain the canal expansion go-ahead vote from the Panamanian people also violated that spirit, as it effectively has allowed the canal to be put into the hands of special interests. Furthermore, to get that vote, the people of Panama were assured that a proper assessment of the proposed “concept” would be done once the project was approved and funds became accessible to pay for such work. However, once the project was “approved”, the need to fulfill those campaign promises evaporated. The present plan – with its inefficient dead-end lock design – will cheat the Panama Canal of its full potential by putting its peak capacity permanently out of reach, and will cause needless damage to a valued water-resource forever.